Hello, my name is Juliet. I’m a retired teacher. This is what I looked like when I was six! 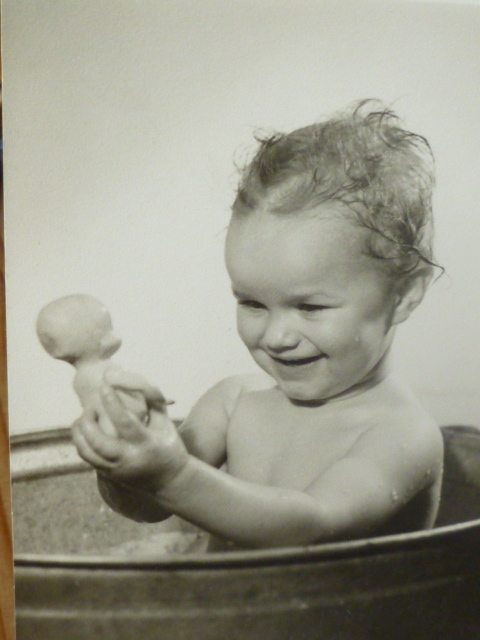 Here I am as a baby, sitting in my tin bath and holding my first celluloid doll. I am looking very pleased with it. I am not sure how old I am here, probably about five or six, but I remember the doll. I thought she was beautiful. You cannot see her clearly in this photograph but you can imagine her; she was a bride doll dressed in silky white clothes that were glued on and she had a filmy veil. Her hair was very shiny and very blond but her body was hard and seemed to be made of clay and I knew that if I dropped her she would break. When you moved her arms they creaked and scraped in an alarming way. She had very wide staring eyes with long lashes which my mother said were so long she could sweep the floor with them. They opened and closed with a little clicking noise. Her mouth was like a little red rosebud. My nana, who gave me the doll for Christmas (my sister had one too), told me she had bought her from a traveller who came to the door. I thought that sounded very romantic. All the dolls I knew had come from shops. I look very fond of her in this photograph but I cannot remember playing with her. The trouble was,being a fragile bride glued into her clothes, all she could do was get married, over and over again, and I expected more of my dolls than that. 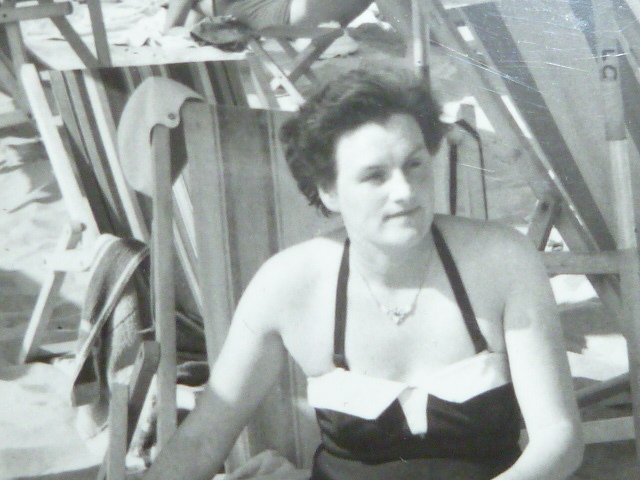 When I was very young, my mother and father went to Venice for a holiday. I don’t know how they afforded it and I have no idea if they went alone or with friends. Other people appear in some of the photographs and everyone looks happy. My parents were not happy in their marriage for long which makes these photos so poignant. 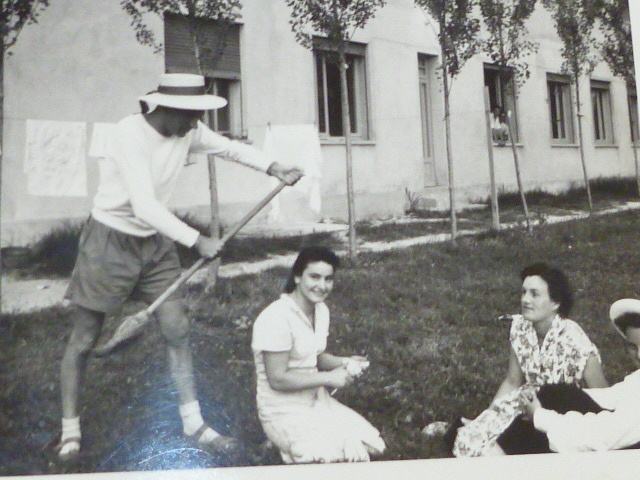 My father had a great sense of humour and here he is pretending to be a gondolier and looking quite handsome until you get to the socks. 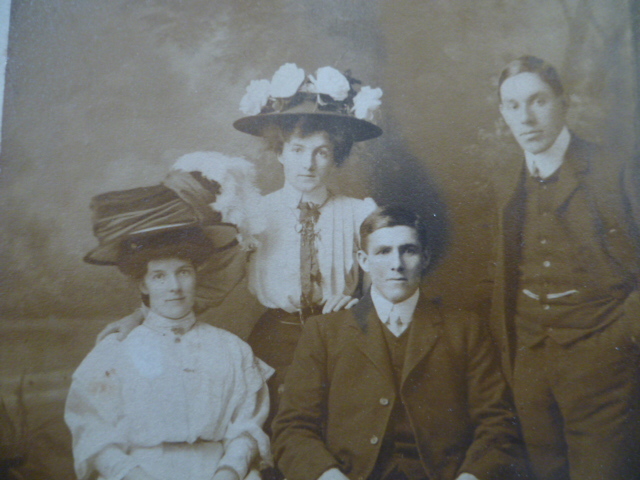 My mother, who is sitting in a flowery dress on the right, is almost smiling but looks self conscious. She hated being photographed. My baby sister and me were left in a place called Machen, which is in SouthWales, to be looked after by our maternal grandmother. I remember nothing about it but I do remember the presents my mother brought back for me: a fragile glass necklace with beads made to look like miniature oranges and lemons with leaves of translucent lime green, and a small jointed doll with jet black hair, dressed in red satin and lace with an elaborate hat stuck tightly to her head. Her black shiny shoes were painted on. Gradually I eased the hat off because I wanted to brush her hair but it was covered in glue and now she looked worse. The same thing happened when I tried to take off her clothes. The lacy shawl came away without too much damage but the delicate silky dress tore and nothing could be done to restore her to her former perfection. For me, a doll whose appearance could not change was useless. My dolls had to feature in elaborately constructed,dramatic games, which as I got older were based on the books I read, books like Tom Sawyer,Treasure Island, A Little Princess or The Hobbit. I cannot remember what games I played with my dolls in my grandmother’s house but I do know that there was simply no place in my stories for a character whose hat was stuck very firmly to her head. 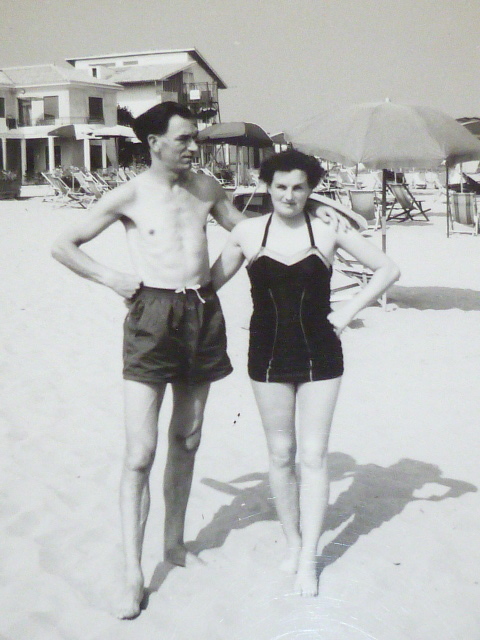 My parents, in their early twenties, posing on a beach during their Venice trip. A bright boy with a passion for mathematics,my father was made to leave school at fourteen to work in his father’s barbers shop in Fishponds, Bristol. Steeped in romantic literature, and the socialist dreams that helped him see beyond the dull life his parents had mapped out for him, he proposed to my nineteen year old mother on bended knee. She recalled, with a smile, that she had told him to get up and stop being so silly. Once married, my father studied at night school to gain the qualifications to be a maths teacher, while my mother studied speed typing and shorthand and dreamed, hopelessly, of being a doctor. My father, brought up in a family where there were no books, loved to read. When I was young he read me Treasure Island and Robinson Crusoe. Later it was through him I learned of Byron, Shelley and Shakespeare and the works of Dickens and D.H. Lawrence. From him too I caught the newspaper habit. Two years old,helping my father do the Manchester Guardian crossword! My mother’s parents had a few leather bound books shut away behind the glass doors of an ornate cupboard but they visited the library every week to stock up on every day reading matter – my grandfather would sit on his bed, smoking a woodbine reading thrilling stories about cowboys while my grandmother, who felt a cut above grandpa, read ‘good’ novels but secretly she relished the lurid magazines which she hid under the sofa cushions. She had the appalling habit of tearing out pages from library books if she thought they were indecent! My mother, who had learned poems by heart at school, recited them to me in a terrible voice with an awful expression on her face. Goblin Market was a favourite, and I loved the thrill and horror of it and would beg her to look at me “with your hateful face” just to experience the shiver of fear again. It was my father who built the toy theatre with red velvet curtains that swished open and real lights and scenery that slid up and down. He put on puppet shows for my birthdays compete with sound effects and dramatic explosions and funny voices; it was my mother who dressed the tiny characters in satin and gold with sequins that sparkled in the lights when the little figures glided momentously across the stage. Here I relished the adventures of Alladin or Cinderella or Sinbad. Later, when the shows stopped, the puppets, prised from the sticks they stood on, moved into the dolls house; extravagantly dressed princesses with thick blond plaits and handsome princes with with sabres and curly toed slippers began living alongside cheap pert faced plastic dolls from Woolworths. It couldn’t last. Not able to sit down they spent their time leaning lethargically against walls or propped up against furniture. Eventually they broke, unable to compete with the intense and dramatic story lines in the other dolls lives. In the Venice photograph,in the first years of their marriage, my father and mother have their arms around each other. My father has taken off his glasses. He was very short sighted so whatever he is looking towards, he cannot see it. My mother is allowing herself a small smile. I never ever saw my parents lovingly touch one another. Perhaps this is one of the last times they ever did. 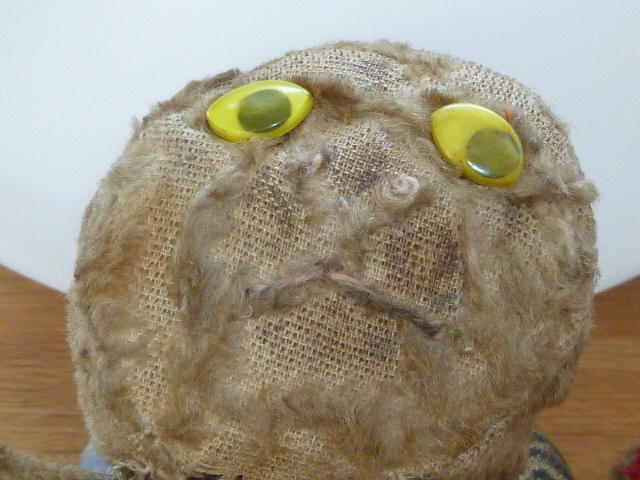 This frankly horrifying face is what remains of my much loved glove puppet Prudence. She was based on a puppet from an early television programme called Prudence Kitten, made I believe by the same woman who brought us Muffin the Mule with his clicking hooves and very visible strings. So threadbare and loved is my Prudence that her soft fur has worn away leaving prominent, wickedly yellow, staring glaring eyes that bestow upon her her a kind of horror story personna about as far from the original sweet grey pussycat as it is possible to be. That I loved her, literally to bits, is obvious. Her soft pale pink velvety paws wore into holes that were beyond mending. They were replaced several times but my mother was not good at sewing and Prudence has ended up with clumsy red corduroy paws. Her lovely grey felt ears fell off and they too were replaced, but the new ears were not perky and they flopped about. When they fell off yet again no-one bothered to sew on new ones. 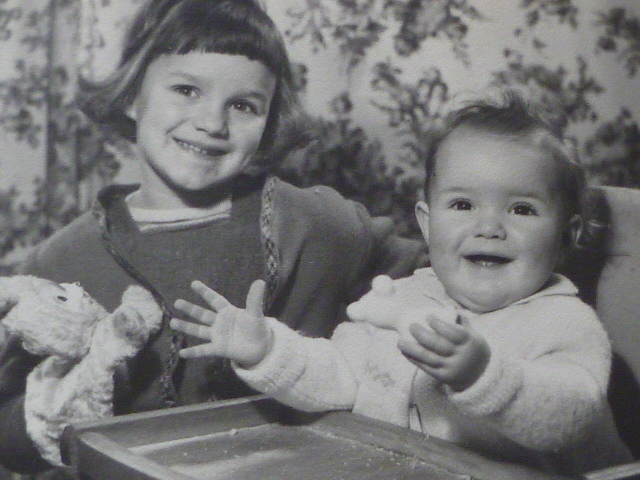 Not long after this my sister and I were given cheerful string puppets, brother and sister clowns. Mine had short yellow string hair and stripy trousers but I was irritated by his collapsing nature and too impatient to learn how to pull the string sand although I did try I never took to him. In fact I was jealous of my sister’s puppet because she had the girl with beautiful yellow plaits, eyelashes and a pretty sticking out skirt. This photograph though was taken before the string puppets arrived. I have a terrible haircut almost certainly inflicted on me by my Nana who hated long hair and would try to massacre it on a regular basis. At the age of five maybe I didn’t mind but I minded a lot as I grew older. I look happy here however. My mother told me that I was very proud of my new baby sister and made all my friends look at her in her pram when my mother collected me from school. It looks as if I am entertaining her with a glove puppet that I do not remember at all. But it is certainly the start of our many childhood games together, games we still talk about today. 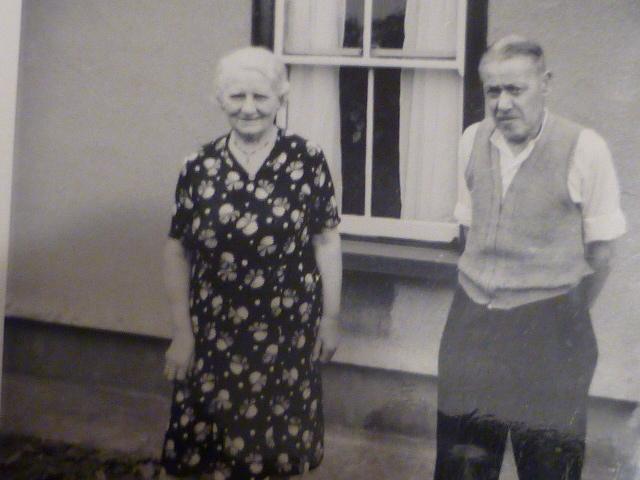 Aunt Edie and Uncle Alf. Edie and Alf were related to my paternal grandparents but I don’t know how. Was Edie my nana’s sister? Or was she grandpa’s? Or was it Alf who was a brother to one of them? When you are a child you don’t worry about detail like that. There is no one to ask now. Edie, like my nana ,had a pale powdery face which was also quite whiskery. She had a soft Somerset accent and she was gentle and kind.She had no children which I was told was a great sorrow.. When I went to her cottage, long since demolished to make way for a dual carriage way, I remember it being a torment to sit nicely while the grown ups drank tea and talked about boring things. Uncle Alf sat and wheezed on his usual chair in the corner. The wheezing was because of gas in the trenches but he never talked about it. I always thought he was called Uncle Elf because that’s how nana said his name. He said very little, just coughed and gasped. Out the back, in Edie and Alf’s garden, was a huge cage full of chickens and I was allowed to feed them on my own which came in handy once when I went to stay the night. Aunt Edie had cooked some very chewy, gristly meat so when she wasn’t looking I spat it into my hanky and then went to feed the chickens. I felt very guilty as the chickens fussed and clucked around the chewed up mess. But what I remember fondly is the clockwork television set which, if I stared at it longingly enough, I was allowed to play with. It was a brown box about the size of a tea caddy, and when you wound it up, using a key in the back, a beautiful dark haired lady in a flared dress played a tune on a guitar. She was smiling and nodding like grandpa and her hand strummed up and down very convincingly. There were knobs on the front so you could pretend to turn it on like a real television. It was so basic, the picture was black and white and you could see the ghostly outline of her downward moving arm when she was strumming upwards. Nothing else happened,, but I thought it wonderful and I turned it on and off so often that it eventually broke. I cannot remember the tune at all. Upstairs in my house on a shelf in the front bedroom I have a cardboard box full of old black and white photographs. 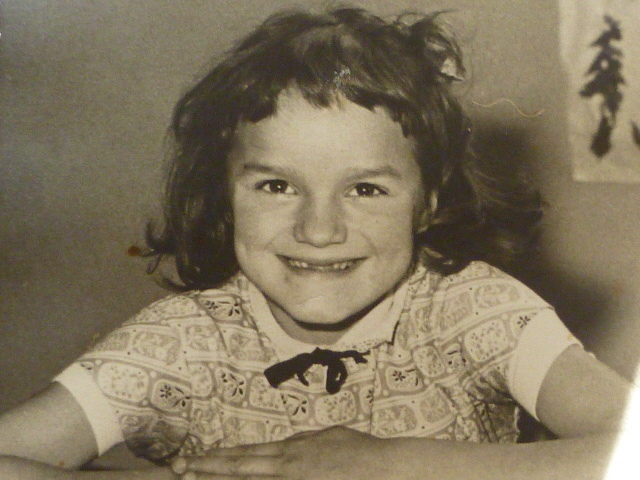 When my mother died I found these photographs hidden away in a drawer along with newer colour photos of my children that I had given her and photos my sister had sent of hers. Grandparents are supposed to be proud of their children and grandchildren. They are meant to display the photographs on mantlepieces, sideboards, grand pianos in some cases. My mother seemed to hate photographs. She loathed any of herself and placed no value on photos of her family. They all ended up in the same place. Shoved into a plastic carrier bag and then pushed out of sight along with a jumble of old bills, letters and cards. Going through them I find I know so little about the people and the places, yet there are some, like these here, which I must have talked about with her. 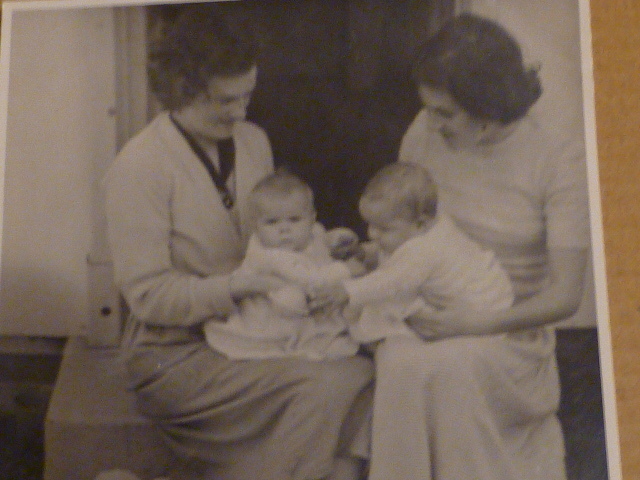 I am the eldest of three and I like to think that my mother was happy to have her first baby. Here she is sitting on a step with a friend and they have swapped babies. I am on the right trying to grab the other baby’s rattle while the other baby seems much more interested in whoever is taking the picture. When she talked about this photo my mother said that her friend’s baby was rather placid. 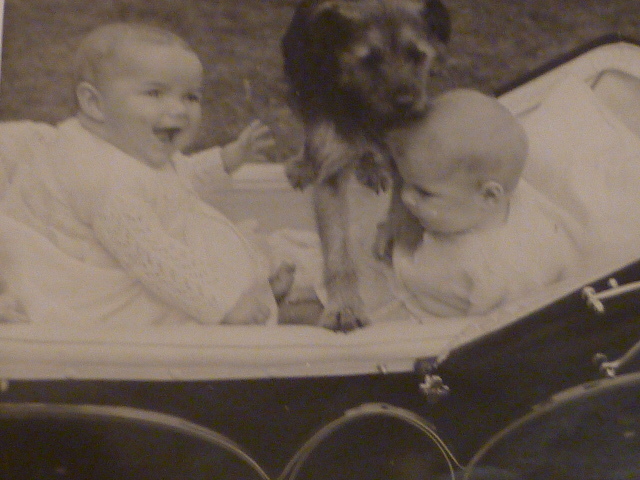 It makes me laugh when I look at the next photograph and remember my mother telling me that I was highly delighted when the dog jumped up into the pram we were sharing. Who was this friend and her baby ? I have no idea. She is not my mother’s best and long term friend Joan Bird who apparently, when her first baby was born, sent a card announcing “The baby bird has arrived” which I think is rather nice. I have strong memories of Christmas Day and the excitement when there was a box under the tree that could only contain a doll. I loved new dolls,the way they smelled,the tiny clicking noise when their eyes closed, their shiny plastic shoes,above all the importance of finding the right name. My favourite was a baby doll I called Hilary. She had a soft peach coloured body stuffed with kapok and a hard head covered with painted brown curls and a rosebud mouth and big brown eyes. 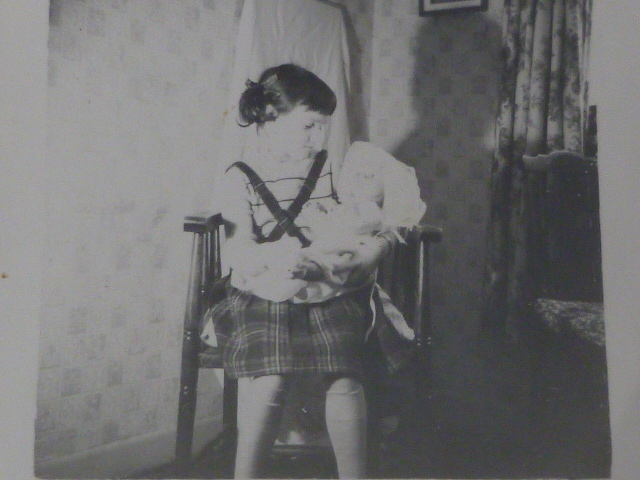 Her clothes were lovely,a blue flowery dress and little shoes that had fiddly straps but I was soon dressing her in real baby clothes,soft little knitted bonnets and oversized cardigans with the sleeves rolled up.I wheeled her about in a metal dolls pram and at night put her to bed in a plastic carry cot. My other favourite toy was my dolls house. It was a bungalow made by my father who had also made us a toy theatre where he put on shows with real lighting and sound effects.The bungalow was L shaped and sat on a board which meant it had a front garden and a path up to the front door.To the right of the front door was the bedroom where the mother doll eventually spent her days reclining in bed because her legs had fallen off an no one could fix them.I was probably reenacting the scenes in What Katy Did when she is confined to bed and learns to be the epitome of perfect womanhood because the mother doll was very sweet and patient,quite unlike my real mother. On the left hand side was the children’s bedroom which I cannot remember at all although I do remember the children.There was always a naughty one who would do amusing things like climbing on the roof and one who was beautiful. I spent a lot of time styling plasticine hair for her which to my mind looked fabulous,and I made her dresses using squares of tissue paper. Was there a father doll? I cannot remember but I expect he was away like Katy’s father! I do recall the sitting room which was,to my mind, very elegant with its French doors with orange glass windows that opened out on to a narrow strip of green painted grass. A friend had given me a real Victorian dolls sofa which was so big it took up most of the room but gave it a very refined air.You could only reach into that room through the side and it was a bit awkward so the dolls only used it on special occasions like Christmas and weddings.The kitchen was always an unsatisfactory room because I never had quite the right furniture and nothing was quite the right scale. The last time I ever remember playing dolls houses with my sister was when we got into trouble for making such a mess.I had decided we needed to make Christmas as authentic as possible and soap powder seemed the ideal thing for snow.We spent a happy time sprinkling ‘snow’ over the houses and the floor and the dolls were thrilled when they came out into their garden and began throwing snowballs. My mother was not so thrilled when she came upstairs to see what all the shrieking was about!